Spanning more than 5,600 ft., Victoria Falls unleashes nearly 250,000 gallons of water every second, but surprisingly fits easily into your laptop or mobile device. Actually, that last fact only applies to this amazing 360-degree video, but it's the next-best thing if you can't actually get there. 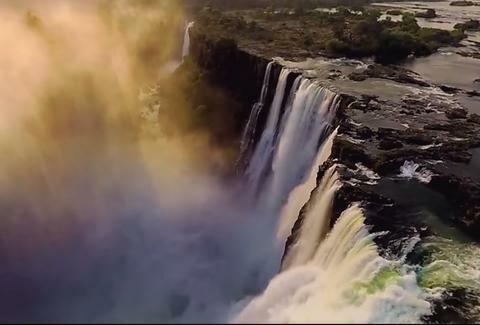 The 360-degree video released by National Geographic shows off the terrifying beauty of Victoria Falls as well as the pool of calm water called "The Devil's Pool" which sits on the falls' edge. It's full of stunning shots of the towering cliffs and lets viewers enjoy every angle of the falls simply by clicking around the screen, making it both fun and educational like mom always wanted. Watch it and don't forget to to pick up your jaw. Kara King is a News Writer at Thrillist and dropped her jaw pretty early on in this video. Send news tips to news@thrillist.com and follow her at @karatillie.